4. coordinate and develop the Institute’s efforts related to information, communication and technology. 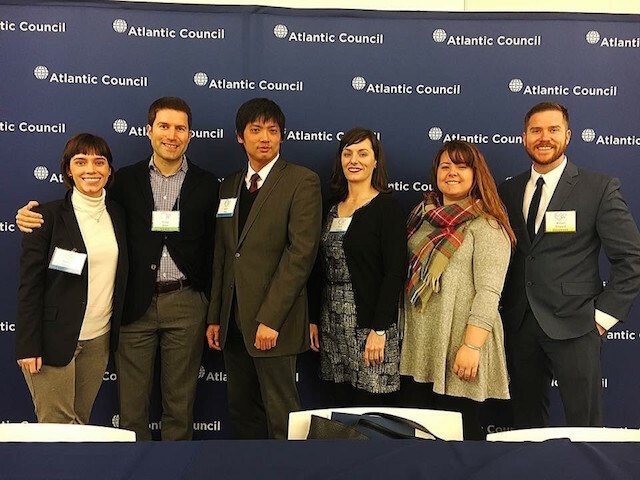 As the only civilian policy school of international affairs in Northern and Central California, MIIS is uniquely able to provide instruction and mentoring for the next-generation of policy leaders. MIIS Cyber is the first effort worldwide to address the intersection of cyberspace policy issues with international affairs from a social-science perspective. This includes hard security, human security, economic/business issues, language and linguistics, social media, digital ethics and environmental issues. Congruent with Middlebury’s known strength in language instruction and Monterey’s reputation as the language capital of the world, we remain on the cutting-edge when it related to language applications of cyber as well. By hosting our many events in fora with professional, specialized interpretation booths, we are unique in providing our translation and interpretation students with regular access to hone their language skills on cyberspace policy for practicum credit. Housed in the Office of the Dean of the Institute and Vice President of Academic Affairs, we are the only academic program globally which employs a networked approach to address this nexus of cyberspace policy topics throughout the entire school. The MIIS Cyber Initiative (MIIS Cyber) was formally launched as an Initiative of the Office of the President (now Dean of the Institute) on 1 May 2013, following two years of cyberspace policy round-table meetings, workshops and speaker series with experts from academia as well as U.S. government and military. It provides input and coordinates the Institute’s existing classes, grants and research efforts to address the policy relevance of technology in international affairs. This includes hard security, human security/development, digital ethics, cross-cultural communication, social media, linguistics and language, economics/business, peace and stabilization efforts, environmental factors as well as other aspects. Though we do not predominantly provide highly technical approaches to cyberspace issues, we do partner with those who do in order to provide a balanced effort. 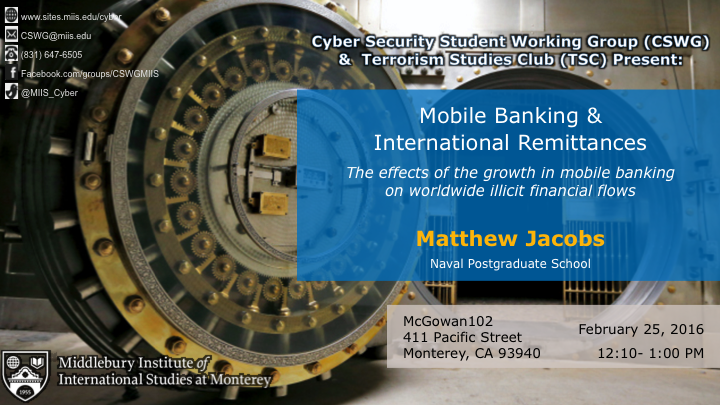 Many professors and students at MIIS incorporate technology and cyberspace issues into their curriculums and research. Our Senior Fellows provide unique, in-depth approaches to these topics. Resource centers such as the MIIS Digital Learning Center (DLC) assists the Institute’s community in the pursuit of academic excellence and digital media fluency while the Mixed-Methods Evaluation, Training and Analysis (META) Lab strives to create a learning environment in which students and faculty share in cutting-edge approaches to research and evaluation. The Globe Center (formerly L10n@MIIS) provides translation, localization, education, consulting and research in the rapidly expanding area of business globalization and localization. Additionally, the WIP (Women’s International Perspective) reports news, world opinion and commentary through the unique perspectives of women. MIIS Cyber’s model is premised on the notion that building an international, interdisciplinary network amongst key cyberspace policy stakeholders provides a balanced voice on salient topics related to information. By partnering with multiple institutes locally, nationally and worldwide we aim to leverage the many strengths of various existing efforts to better address contemporary threats and understand potential opportunities for cooperation in cyberspace. Finally, MIIS Cyber maximizes its geographical location near Silicon Valley and in Monterey, CA which is home to U.S. military and civilian government to reflect the pulse of the local and national perspectives. Our international policy engagements in cyberspace as well as equal reach to all continents ensures we capture international voices on cyber policy issues as well. By doing so, we aim to inform policy makers from a bottom-up approach that can complement existing efforts. MIIS Cyber coordinates courses and executive education workshops that address the various aspects of the information age. For instance, Dr. George Moore, M.
MIIS Radio, the Globe Center (formerly L10N@MIIS) and TEDxMonterey, among others. 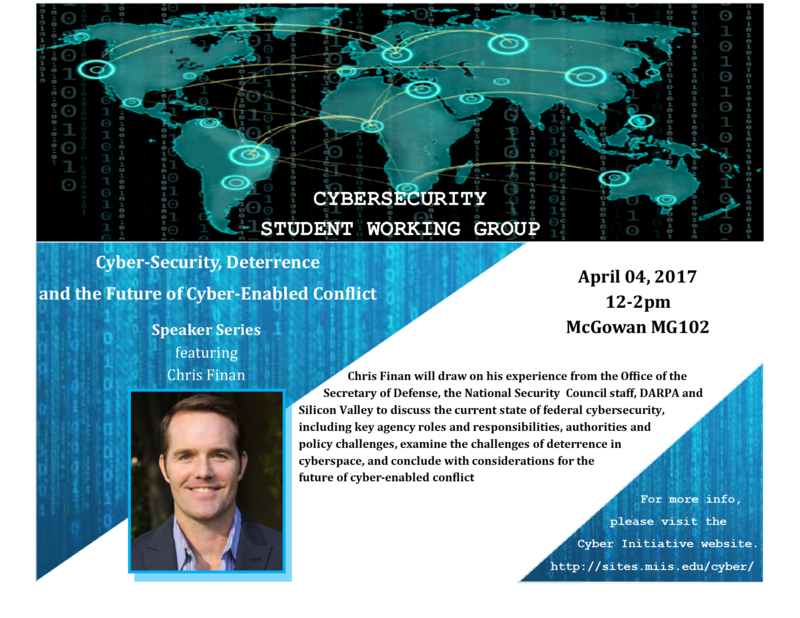 In addition, MIIS Cyber hosts a speaker series of Silicon Valley and government leaders on cyberspace policy issues. We held 18 sessions during 2013-2014 and 11 sessions during 2014-2015, primarily in rooms with professional interpretation booths so that students in MIIS Graduate School for Translation, Interpretation and Language Education (GSTILE) practicum course may sharpen their live interpretation skills with the ever-growing cyberspace policy and technical vocabulary. This serves our multi-disciplinary effort, pairs well with Middlebury’s excellence in language instruction and reflects notion of Monterey, CA being the language capital of the world. 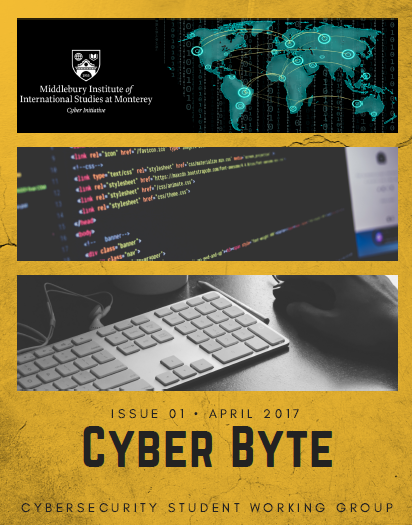 We are the only institution that provides a constant stream of cyber-related policy content for language students. MIIS Cyber is also actively involved in providing executive education on cyberspace policy issues. In summer 2014, MIIS Cyber co-developed and co-instructed a three-week, “Cyberspace Policy and International Relations Executive Education” course with partners at the Cooperative Monitoring Center of Sandia National Laboratories (SNL), sponsored by the U.S. Department of Energy. This initial foray into cyberspace policy executive education for SNL aims to use technology as a platform for cooperation among key countries. Along with providing coursework and executive education, MIIS Cyber also provides guidance to the Institute on incorporating cyber aspects into relevant curricula, proposals and grants. Our MIIS Cyber Senior Fellows provide salient and timely research on how technology touches areas relevant to the Institute’s approach to international affairs, in particular in role of humanitarian affairs, disaster relief, C4 (command, control, communications and computers), UAVs, as well as non-state actors (nefarious as well as NGOs, international organizations and corporations). Our website hosts several resources pages that are continuously updated to address the many facets of cyberspace. Here you can find information on our events, news articles, scholarly publications, books, websites, cyber hygiene, terminology, cyber security policies of various states and key maps digitizing relevant information. William Caput works as a Cyber Security consultant and provides businesses and other organizations comprehensive assessments identifying an organization's vulnerabilities relating to their information and network systems. Will plans to give a simple demonstration and will answer questions from attendees after his presentation. He may show people some specific techniques after his presentation. 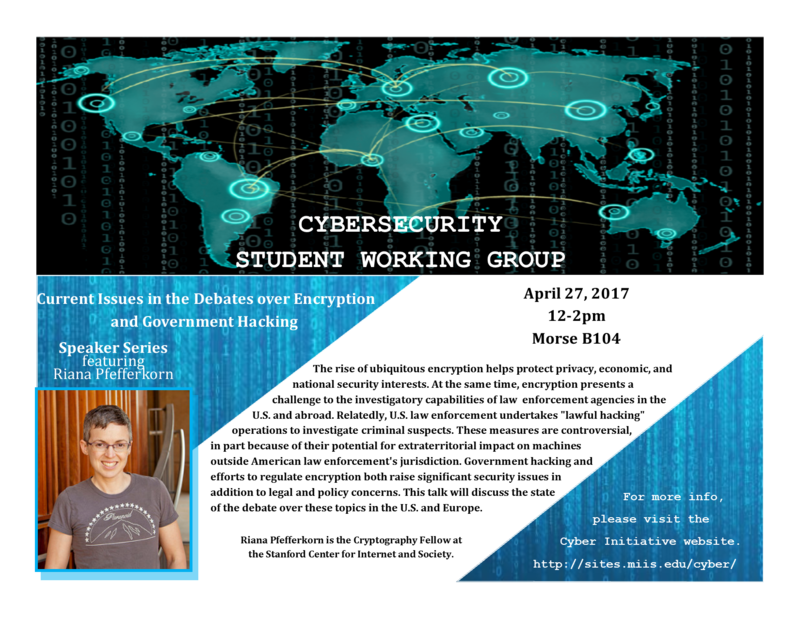 This will be a terrific event for anyone interested in hacking or in learning ways to limit your exposure to malicious hackers. Will is also knowledgeable about the Cyber-Security industry and what skills are helpful for those interested in entering this field.